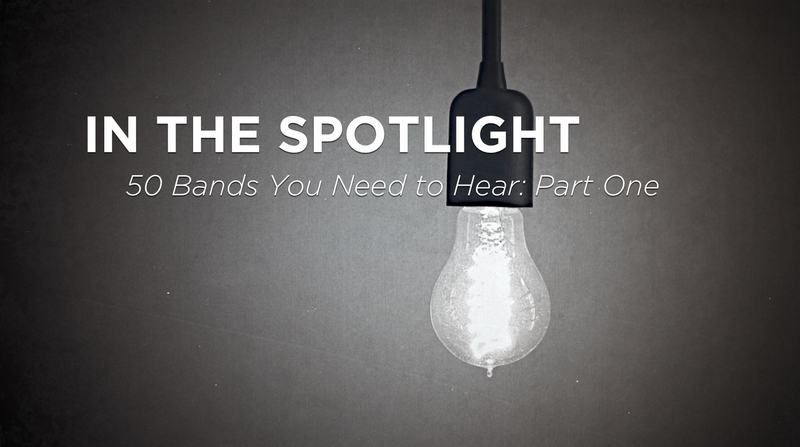 Today we’re happy to bring you part two of our “In the Spotlight” feature. We’ve got another group of artists that we think are worthy of your time and ears. Our contributors have made their picks, put together blurbs, and pulled out recommended songs. If you missed part one, you can find that here. Last year we brought back, and re-branded, one of my favorite features from the AbsolutePunk days: the “Absolute 100.” And as we enter May and the weather finally starts to turn around a little bit, it’s the perfect time to once again team up with our contributors to bring you a whole bunch of new music to check out. Just like years past we’ve compiled a list of 50 artists we think are worth your time. Some of the artists recently released their debut albums and some have been around for a while now but have flown under the radar. However, the one thing they all have in common is that we think they should be in the spotlight and are worthy of your ears. You’ll find the first group of 25, along with blurbs, recommended songs, and sounds like comparisons, below. Today we’re happy to bring you part two of our “In the Spotlight” feature. We’ve got another group of 25 artists that we think are worthy of your time and ears. Our contributors have made their picks, put together blurbs, and pulled out recommended songs. Back on AbsolutePunk.net we would run a feature each year called the “Absolute 100.” The basic idea was to put together a list of bands and artists that we thought needed to get a little more attention. This would range from unsigned, to under-the-radar, to underrated acts that we wanted to highlight. Over the years it ended up being one of my favorite features we compiled (I personally discovered quite a few new bands from it). And, I’ve heard from a lot for readers that you loved it as well. Today I’m excited to bring this feature back under a new name. We’re calling it “In the Spotlight” and we’ve got the same goal: highlight a bunch of artists we think you should check out. This year we’ve got 50 for you. Over the past month our contributors have been putting together blurbs and pulling out song recommendations, and today we’ve got the first group of 25. We’ll be releasing the next set tomorrow. Part two of our feature highlighting 50 artists we think you should check out. Looking for new music to check out? We've compiled a list that we think is worthy of your time.